There has been a sense of outrage and betrayal with the news that Constable James Forcillo has returned to work for Toronto Police Services. Forcillo was responsible for the killing of 18-year old Sammy Yatim. The Syrian-Canadian youth was shot nine times and then tasered during a confrontation with police while he was isolated on a streetcar. The brutal incident was caught on video and rapidly spread across social media. Hundreds angrily took to the streets, particularly youth, demanding an end to police violence and impunity, and to punish the officer responsible for the killing. Even the mainstream press engaged in scathing criticism of the incident and police conduct. Under public pressure, the Special Investigations Unit (SIU) eventually charged Forcillo with second-degree murder for the killing of Yatim. Following a seven-month suspension with pay, Forcillo was quietly brought back in February by police chief Bill Blair to work at the CrimeStoppers desk. 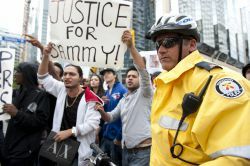 This has brought sharp rebuke from Sammy Yatim’s family which reflects much of the public sentiment. All the press conferences and statements made by the police board, politicians, and Chief Bill Blair are being shown to be a dishonest façade. Instead of the promised “accountability” and “justice”, Forcillo is being protected by the police brass. The treatment of Forcillo stands in sharp contrast to the treatment meted out by the police in working-class communities in the city of Toronto. For many, unprovoked police profiling, violent police tactics, refusal of release on bail, and heavy prison sentences are common place for committing much less severe crimes, or even for no crime at all. This is particularly true for ethnic minority and aboriginal youth. There is a feeling that there is one law for working people, and quite another for the police officers that are supposed to enforce the law. In a statement, Yatim’s family said police should “bear more responsibility for murder, not awarded with a paid vacation for seven months, followed by a desk job”. Unfortunately, this kind of police impunity should come as no surprise given the record of the Toronto police and the so-called police accountability body, the SIU. Indeed, Bill Blair even resisted suspending Forcillo altogether at first. He tried to delay as much as possible, while trying to redirect attention to the SIU investigation. Following Yatim’s death, we explained that it was only mass pressure that led to the suspension, and subsequently, the rare pressing of charges by the SIU. “To this day, the majority of those on the SIU are retired police officers….The record of the SIU speaks for itself. Out of 3,400 investigations in incidents of serious harm and death involving the police, only 95 resulted in criminal charges, 16 of those in convictions, and only three in jail time. Not a single officer has been charged for the death of civilians held in their custody despite dozens of such cases. “The SIU’s purpose is to give a semblance of accountability, to give a democratic “cover” to the crimes committed by police officers, and a means for the police management to deflect social anger towards ineffective avenues. Unfortunately, this perspective is being confirmed. The police management, the police board, the Special Investigations Unit, and the politicians have used the investigations and court process as manoeuvres and distractions. These manoeuvres serve to prevent mass movements from developing and to pacify the anger in the streets. Less than one year later, they are quietly returning to business-as-usual. The movement that had the potential to develop last summer has largely disappeared. That struggle must, of course, be re-organized. The trade unions, labour parties, and student organizations must mobilize their enormous power to support this struggle. This is not only about getting justice in the case of Sammy Yatim. It is also about fighting against the broader social problems of police profiling, lack of accountability, and brutal behaviour. The tragic killing of Sammy Yatim only exemplifies this police culture. This teaches us an important lesson in the fight to defend civil rights — that youth and working-class people can only rely on, and trust in, our own organizations and movements. Fundamentally, genuine accountability can only come when safety and security bodies are democratically run by working-class communities and organizations. We cannot accept an unelected police management and police force. Resources should be given to train and organize security directly at the grassroots level, with the assistance of trade unions and other workers’ organizations, to replace the existing police structures. This would ensure that there would no longer be one set of laws for the rich — for cops and for politicians — and an entirely different set of laws for workers, the poor, and the youth. Under capitalism, the police are used to terrorize poor communities, repress the democratic right to protest/strike, and to protect the private property of the capitalists. In a socialist society, security bodies would instead be under the control, and responsive to the needs, of the majority of Canadians. 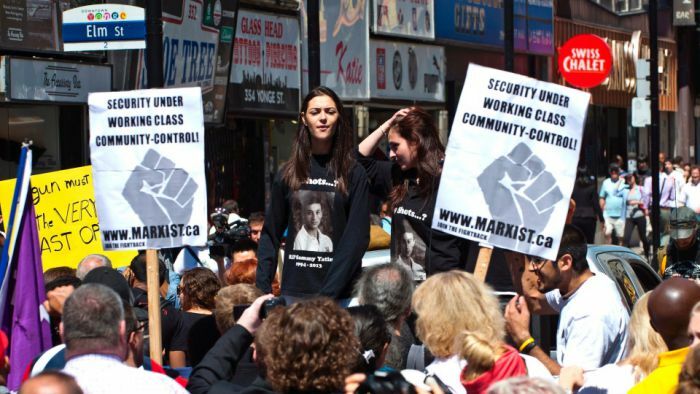 Working-class communities must have democratic control of security!